The following originally appeared on 9/15/08 at Exit 51. Do you ever start something thinking you know EXACTLY how it’s going to turn out only to have those ideas shot to hell? Yeah, me too. Sometimes it involves a DIY project, like that time I thought it would be a great idea to update my grandmother’s bathroom. Somewhere around the step of me trying to strip 50 years worth of paint off the door, I knew I was in over my head. And sometimes it involves cooking. I’ll think to myself “I’ve done something like this before, everything should be fine.” Only, it’s not. Take pork. I don’t know what it is about pork that confounds me so. But it does. Sometimes it comes out great. And other times, despite a hot oven and digital thermometer that tells me it’s done, it’s a spectacular failure. This is reason number one that I try never to serve a recipe to guests that I have never made before. Too much room for error. How can my instruments lie to me like that? At an internal temperature of 155 degrees, why is my pork still pink? And I don’t mean a soft shade of blush. No, I mean a bright pink that screams “I’m not done”. I’m all about life adventures but food poisoning isn’t one of them. Luckily, my friend Microwave finished the job up in a jiffy. But still, this plagues me. How can I not get something as simple as properly cooked pork right? Did I mention this is why we have fried chicken for Easter? 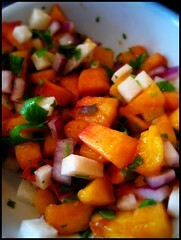 Fortunately, the peach salsa that I’d made to go with the pork was impossible to get wrong. And it brought a little bit of life to a meal that was otherwise completely forgettable. I bet this would be good with fish too. Give it a try and let me know. And if anyone can tell me what the heck I’m doing wrong with the pork, I’m all ears. Put all ingredients into a bowl and mix well to combine. We often have discussions around the dinner table ranking our favorite meat groups. My husband and stepdaughter insist on putting beef first, but I always go with pork. When I really stop and think about it, there’s just too much pork to love. I mean, bacon! Hello!! But seriously, I know what you are saying. I love, love, love pork but I still screw it up sometimes. I can’t make a decent pork chop unless I grill it – either outdoors or in a grill pan. Your salsa sounds quite reliable though and I bet it would be nice with mango instead of peach too. And why don’t I ever buy jicama? Jennifer, I don’t think I could say I love either pork or beef more. I guess it’s like not being able to say you love one child more than another. They’re both special in their own way. Mango? Hells yes. Would be fantastic in the salsa. That salsa is really yummy on grilled fish, too! Makes me yearn for peach season! Kitch, the peaches will be here before we know it. Jenna, I’m convinced that my kitchen is in the center of some kind of freaky thermodynamic Bermuda Triangle. That’s the only explanation I can come up with…and I’m sticking with it.